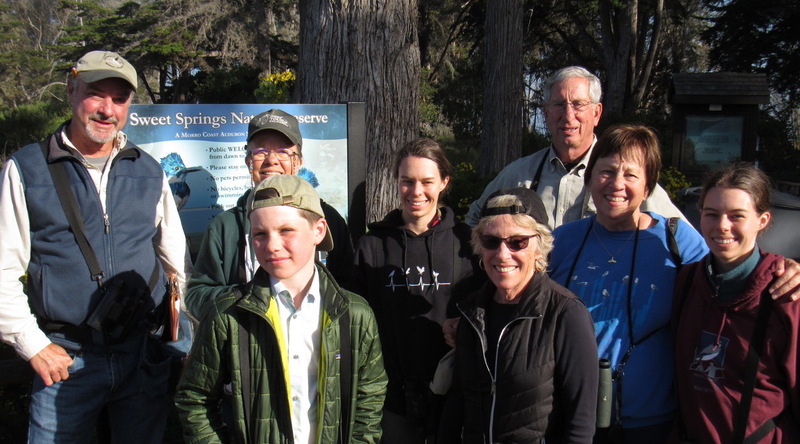 Each year, since 2012, Morro Coast Audubon Society has conducted an annual bi-weekly breeding- bird survey at Sweet Springs Nature Preserve (SSNP). The surveys are conducted by members of Morro Coast Audubon Society. The volunteers who participated in 2018 were: Joanne Aasen, Bart Beckman, Karen Beckman, Jay Carroll, Carrie Miller, Kaaren Perry, Max Taylor, Blythe Wilde, and Fianna Wilde. Those listed each participated in at least two of the nine bi-weekly surveys. Purpose: The main goal of these surveys is to count and identify the species of birds that are using SSNP for breeding purposes, as well as to note those which may use SSNP habitats for foraging during the breeding season. Area: SSNP is divided into three survey sections of approximately equal area, including the eastern section which was opened to the public in November 2017. Each area is surveyed for 30 minutes, using a modified Point Blue Bird Conservation Science area-search protocol. Frequency: The three sections are all surveyed in a single morning. The census is conducted every two weeks, beginning in late-March and ending in mid-July. Data: During the 2018 study period we counted 1,219 birds representing 64 species. Within the Sweet Springs property boundaries twenty-one species (32.8%) were confirmed breeders and another six (9.4%) were probable breeders. We made special note of any indications of breeding behavior including territorial singing, courtship displays, copulation, nest building, carrying food or feeding young, and the presence of recently fledged young. Song Sparrow, Dark-eyed Junco, House Finch, Chestnut-backed Chickadee, Anna’s Hummingbird, California Quail, Mallard, Spotted Towhee, American Crow, Tree Swallow, California Scrub-Jay, Common Yellowthroat, Pacific-slope Flycatcher, Bushtit, California Towhee, Mourning Dove, Great Horned Owl, Black Phoebe, European Starling, Red-tailed Hawk, and Allen’s Hummingbird. Lesser Goldfinch, Nuttall’s Woodpecker, Red-shouldered Hawk, Brown-headed Cowbird, Brewer’s Blackbird, and Hooded Oriole. MCAS would like to extend a huge thanks to the all the volunteers who participate in this study. A special thanks to Jay Carroll, who transcribes the data from each survey and compiles it for future studies. If you are interested in volunteering for next year’s survey, please contact Kaaren Perry, project manager, at kaaren@morrocoastaudubon.org.